July 2017 eBuzz: N.S. wind farm adds three new wind turbines! 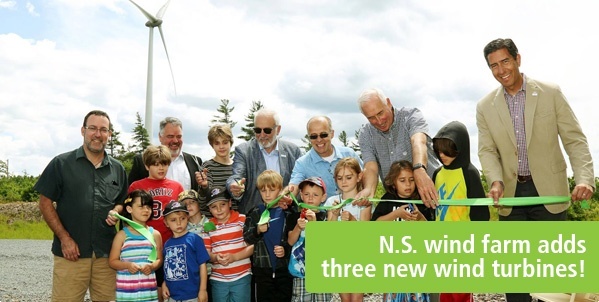 In June, more than 70 people celebrated the unveiling of three new wind turbines at the Ellershouse Wind Farm in Nova Scotia. The farm now has seven wind turbines generating enough green electricity to power almost 5,000 Nova Scotia homes. Bullfrog supported the launch and expansion of the project, and sources the power produced by the wind farm for bullfrogpowered customers in the Maritimes. The ribbon cutting included developer Minas Energy, Alternative Resource Energy Authority, which owns the facility, and East Coast Credit Union, a Bullfrog customer. Thanks to the bullfrogpowered community for your continued support! Gulf Islands Secondary School, located on Salt Spring Island, B.C., is not your average high school. That's because it's home to an 84-panel solar system—and those panels help fund an annual scholarship for a student pursuing post-secondary environmental studies. This year's recipient of the Solar Scholarship is Andrew Chan—who volunteered almost 400 hours to help install renewable energy systems in the region. Congratulations, Andrew! Did you know that you can give the gift of green energy to a friend or loved one? When you bullfrogpower their device, you help them reduce their environmental impact while taking a meaningful step toward fighting climate change. Your recipient will also receive a personalized digital certificate representing the green power you’ve purchased on their behalf, and you'll feel great knowing you're creating a cleaner, healthier world together. Get started today! The summer Buzz newsletter is here! In the latest Bullfrog Buzz newsletter, we collected thoughts from bullfrogpowered customers reflecting on our clean energy future for Canada's 150th. The Summer 2017 Bullfrog Buzz also features great summer recipes, the latest green energy news and bulletins from bullfrogpowered businesses across the country! Click to read. "[My husband] has been wearing one of your ball caps for 10 years [photo above left], promoting Bullfrog every chance he gets. He's doing a good environmental deed by keeping his cap, but it's getting to the point that my mother refuses to be seen in public with him wearing it! Would it be possible to send us a new one?" Thanks for the email, Donna! We hope your husband enjoys his new lid. Don't be afraid to reach out to replace your well-worn Bullfrog cap or bullfrogpowered lawn sign—email us at customerservice@bullfrogpower.com today! Bullfrog partner Clean Energy Canada wrote a recent blog post analyzing the role Canada should strive to play in the world's transition to a clean energy economy. Clean Energy Canada's Merran Smith writes: "Growing the clean energy economy creates jobs for workers right across the spectrum. Both Canada and China know this. And they know that tackling climate change requires smarter, cleaner, less wasteful technologies throughout the entire economy." Read on. Bullfrogpowered Eagle Wing Tours offers whale watching tours in B.C., but did you also know the company uses proceeds from the tours to help protect whale species? The owners of Eagle Wing Tours even started their own fund—the Wild 4 Whales Foundation—to help protect whales and other marine wildlife through research and education programs. Book a tour today! In July, Chef Stephen La Salle from feast + revel—the restaurant at the bullfrogpowered Andaz Ottawa ByWard Market hotel—took guests on culinary flights of fancy in the nation's capital. Guests were suspended 150 feet in the air in the Skylounge to experience fine dining with an unparalleled view of the city. feast + revel's menus feature local, organic, hormone-free and sustainable produce.